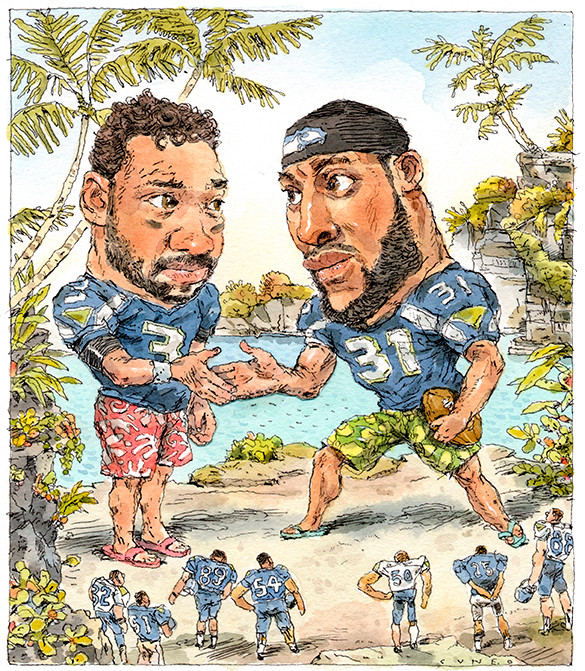 How one tropical trip, organized by QB Russell Wilson, helped the Seattle Seahawks settle their beefs and put the Super Bowl XLIX loss behind them, once and for all. This story appears in the Sept. 7, 2015, issue of Sports Illustrated. Subscribe to the magazine here. The oversized black bus carrying 30 members of the Seahawks drove away from Maui’s Wailea Beach and banked right, up a hill, onto a dirt road. It climbed through a thicket of palm trees, bouncing over uneven terrain, until linebacker Bobby Wagner wondered if they had made a wrong turn into the jungle. Wilson spoke. So did receiver Doug Baldwin and safety Kam Chancellor. This went on for 45 minutes until most everyone had said something, harsh words had been exchanged and all grievances had been aired. Players who believed that Seattle’s coaches opted to pass—instead of handing off to Marshawn Lynch—to make Wilson the Super Bowl hero said so. Those who felt some teammates had not taken responsibility for what happened said as much. Wilson told Lockette that, faced with the same situation, he would throw to him again, without hesitation. Others focused on what their teammates meant to them, on why they even play football, on how the team needed to remain united and how they would refuse to let one defeat define them. “It gave me chills,” says Wilson. All of the Seahawks’ leaders were in attendance, save for Lynch, safety Earl Thomas (who was rehabbing his shoulder) and any linemen. “Part of [the talks were about] the Super Bowl, and the fallout, but most of it was just—we didn’t feel like we’ve reached the sustainable level of success we know we’re capable of,” says Baldwin. “It wasn’t even necessarily about football. It was more about our responsibility as teammates to each other. 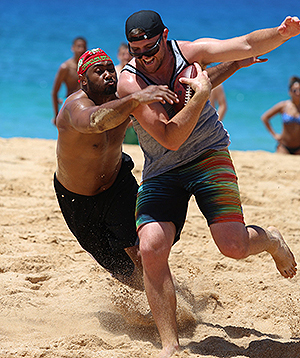 Wilson organizes a similar trip each spring, but in the past he has invited only quarterbacks and pass catchers. 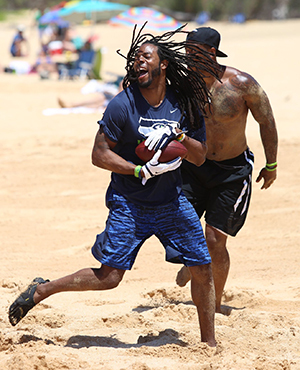 Run some routes, break some bread, work on timing ... an offensive tune-up, more or less. A venture like this year’s—a work-vacation with more than half the team, their wives, their children and support staffs—doesn’t happen in the NFL. Not with a crowd this size or with position groups this varied. Not with a chartered 737. But Super Bowl XLIX was not a typical defeat, and this was not a typical off-season. This much was evident in the rift that some Seahawks sensed had developed between the offense and defense—no fights or shouting matches or anything like that, but silent tension, an awkwardness to their off-season interactions, the kind of strain that can deepen and wreck even the most promising campaigns. (Wilson, in an interview last week, dismissed the notion of division, but six people who went on the trip told SI that it existed.) Even on the flight to Hawaii, most of the defense settled in the back of the plane while most of the offense congregated toward the front. The jaunt would serve two purposes: help the Seahawks get over the loss and avoid the slow start Seattle suffered in ’14, when, after bludgeoning the Broncos in Super Bowl XLVIII, the team opened 3–3. This loss threatened to be more difficult to overcome than a championship hangover, even if most of the roster had returned intact, and even if Seattle had added Pro Bowl tight end Jimmy Graham from the Saints. That’s what Wilson wanted everyone to focus on—not the defeat but how to stop it from unraveling the new season before it began. Wilson’s manager, Matt Rodgers, and childhood friend, Scott Pickett, handled the logistics: They booked hotel rooms, planned scuba-diving and whale-watching excursions and hosted a luau on the roof of their hotel. Wilson, meanwhile, scrutinized every decision, his attention to detail reminding his mental coach, Trevor Moawad, of another client at the Moawad Consulting Group: Nick Saban. The trip unfolded according to a meticulous schedule, with every hour accounted for: morning workouts, afternoon outings, dinners at night. Moawad compares the physical, mental and bonding components to work he’s done with Special Forces units. Each night teammates gathered to watch inspirational videos interspersed with clips of Seahawks players in key moments of important games. (In one video sprinter Michael Johnson talked about how he retained his world No. 1 ranking during the 1990s.) After each video a player—Wilson one night, Baldwin another, Chancellor a third—addressed the group. The Seahawks’ Hawaiian excursion marked but one stop in Wilson’s endless off-season, in which he started dating a pop star, Ciara, hosted Nickelodeon’s Kids’ Choice Sports Awards and attended a private party at the White House. But whereas everything seemed to go so smoothly following the Super Bowl win over Denver, this summer, after the loss to New England, not so much. Wilson found himself in TMZ’s crosshairs, photographed with a model in Los Angeles. He was criticized for his prolonged contract negotiations. (in July he signed a four-year $87.6 million extension, with more than $61 million guaranteed). 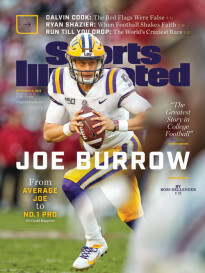 He was mocked for his insistence—to Rolling Stone and on Twitter—that a recovery water possessing something called “nanobubbles” helped him avoid a concussion following a brutal hit in the NFC championship game. For a celebrity athlete who keeps suits stashed in his Mercedes—in case, you know, he ever needs a tux on a Wednesday—and swaps his iPhone for a Windows model when he attends Microsoft events, these incidents served to remind Wilson that no matter how carefully you craft your image, you can’t control how you’re perceived. Wilson tuned out his distractions by focusing instead on what he could control, arranging the trip to Hawaii and training with a new speed coach, Ryan Flaherty. Wilson altered his workout routine this off-season. He didn’t think it helped him to throw as much as he had last summer with random receivers—guys who happened to train at the same facility, as opposed to his own teammates—so he focused more on speed. He twice met with Flaherty at the Prolific Athletes facility in Carlsbad, Calif: once shortly after the Super Bowl, cutting short a 10-day vacation to Cabo, and again before training camp. Using quantitative analysis, Flaherty focused on improving Wilson’s strength-to-weight ratio. End result: Wilson ran a 4.49-second 40-yard dash this summer, six one-hundredths of a second faster than his NFL combine time three years ago. “He’s faster and stronger than he’s ever been,” says Flaherty. Flaherty has worked with the likes of Cam Newton, Jameis Winston, Marcus Mariota and Johnny Manziel, but Wilson does not remind him of any other quarterback. 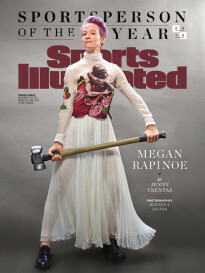 Instead he draws the comparison to two other athletes he trains: Kobe Bryant and Serena Williams. “Russ shares similarities with the best athletes I’ve trained,” says Flaherty. “Like Serena. They’re both obsessed.” That’s why, when Wilson went to Hawaii, he took Flaherty with him. In the week before Super Bowl XLIX, friends described Wilson as the happiest they had ever seen him. He was a full season removed from a divorce and, at age 26, he was already approaching his second title game. He was certain the Seahawks would repeat. Then they lost ... after he threw the decisive interception. Publicly Wilson projected confidence. Privately, the Super Bowl defeat had an impact. Those close to him could see how much it hurt. Only Wilson didn’t linger on the pain. He looked for a solution. And in the Hawaii trip he found it. After the meeting on the cliff, the Seahawks’ bus drove down the mountain and parked back at the beach. There players found two football fields outlined in the sand, music blasting from large speakers. They split into four teams. The only rule: They couldn’t play their regular positions. Chancellor threw passes and Wagner caught them and Wilson defended them. The next day the Seahawks boarded another 737—this one with Go Russell splashed across the side—and flew back toward Seattle. This time offensive and defensive players mingled throughout the plane as it soared over the Pacific Ocean. “You felt a reassurance,” says Lockette, “that we’re going to start this year on a clean slate and do everything we can to get back to where we were.